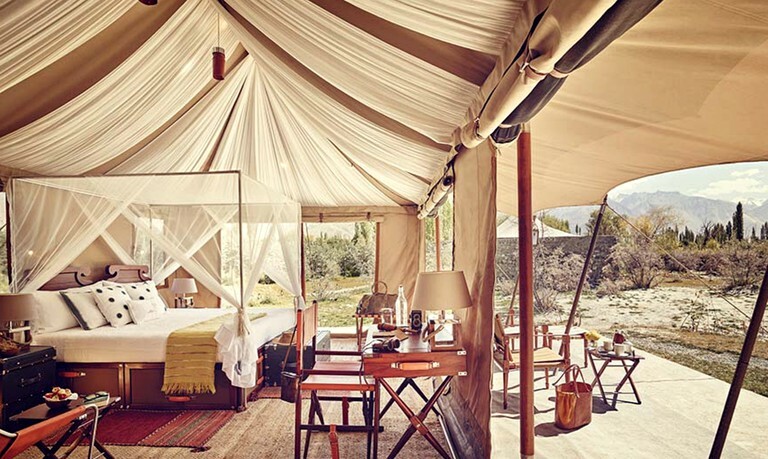 These luxury camping tents near Leh, Jammu and Kashmir, are the perfect base for a unique getaway with a loved one. 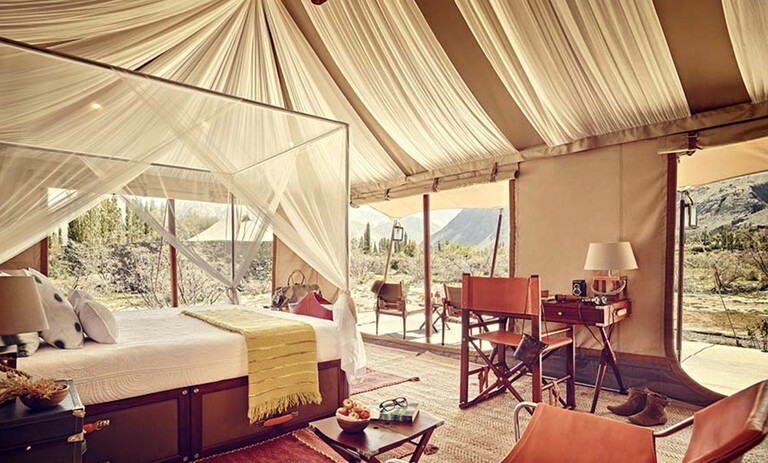 Beautifully furnished and spacious, these tents rest royally on thick wooden decks and treat guests to a spellbinding 360° panorama of mystical mountains that encircle the location of the glamping site. 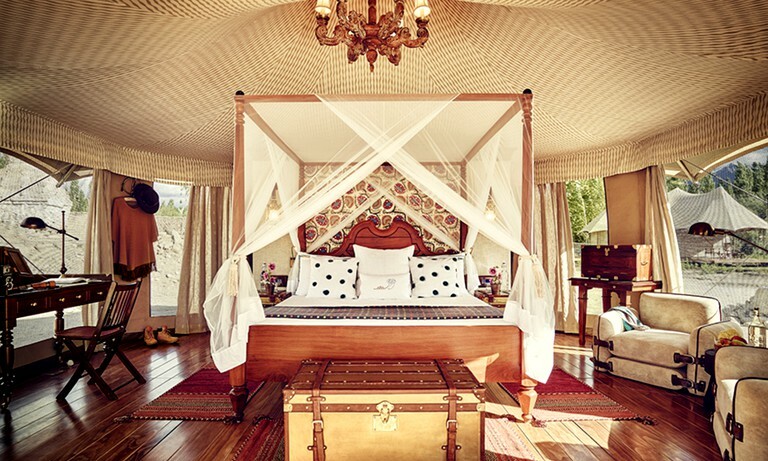 Whether resting on the king-sized bed or in the stylish bathroom, views from the huge netted windows won't let glampers forget the magical landscape that envelops the property. 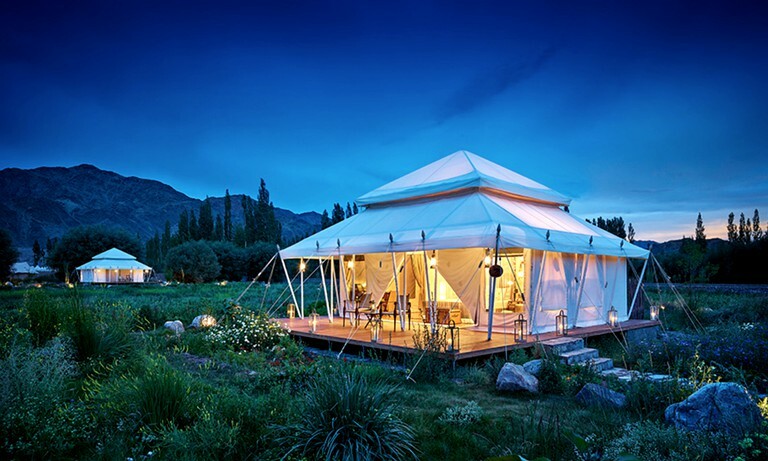 The triple layered tents, with their natural insulation, ensure guests stay warm and comfortable. The tents have anti-weathering and fire-resisting fabric. These deluxe camping accommodations sleep two guests each in the king-size bed equipped with luxury linens and a memory phone mattress, and one additional guest, with extra bedding. There is a large wardrobe with an electronic safe, as well as an in-house phone set, custom made wash accessories, customized bath accessories, a mini bar with complimentary refreshments, and a writing desk with custom stationary. 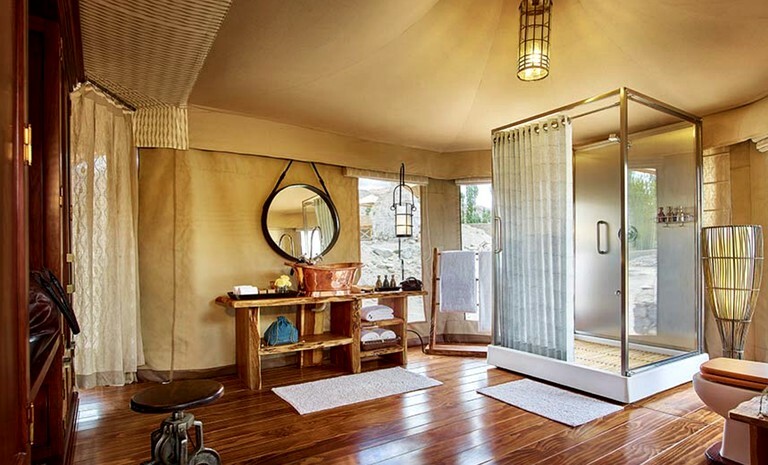 The ensuite bathroom has a shower cubicle with running hot and cold water 24 hours a day, along with a hair dryer and shaver socket, and custom-made bedroom slippers, eye masks, and earplugs. There is a dining tent on the property, offering indoor and outdoor sitting, fresh, organic and local garden ingredients, along with international, national, and regional cuisine. There's an in-house bakery and complimentary culinary classes too! The chefs take into account all dietary requirements, if any, while preparing meals. 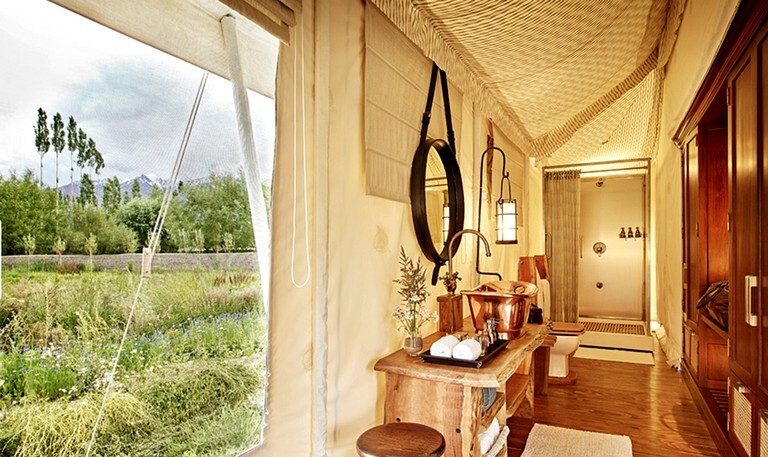 At this unique and gorgeous glamping site, guests can relax in their individually designed tents, with en-suite bathrooms, private decks, crisp linen, and the services of their very own butler. Enjoy delicious family recipes in the fantastic restaurant, or hear stories from specialists and fellow glampers over fire-lit evenings under the stars. 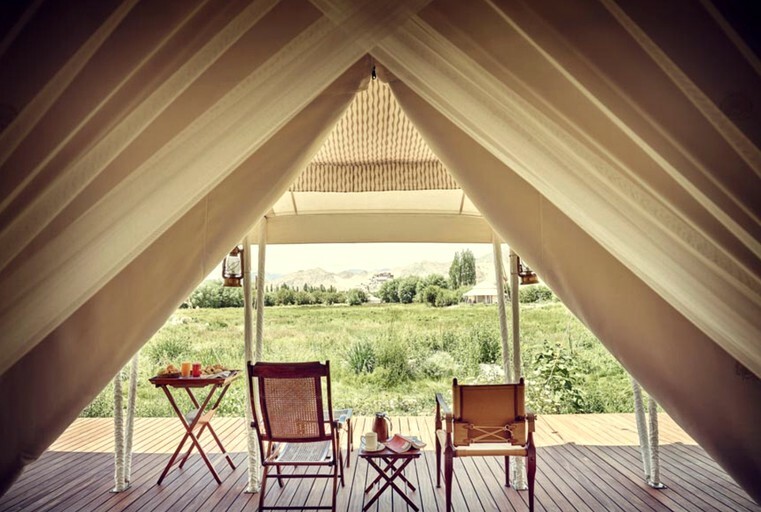 Activities in the area of this glamping site include hiking, horse polo, archery, rafting, bird watching, and cycling. For those who love a tour, there are cultural and monastery tours nearby. 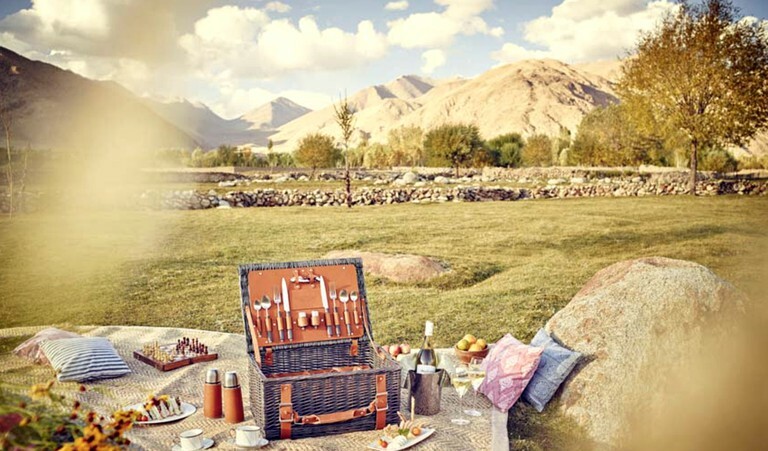 If exploring is more something guests wish to do while glamping at this site, the center of Leh is a 30-minute car journey and well worth the visit. 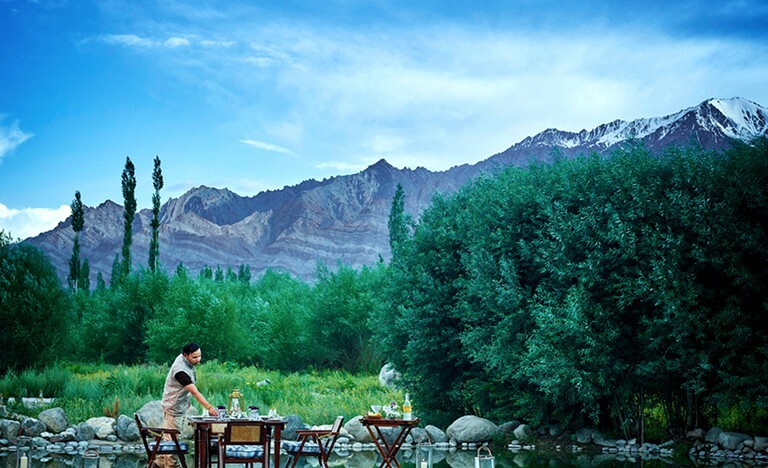 Pangong Tso, Hall of Fame, Gurdwara Pathar Sahib, and Confluence of the Indus and Zanskar Rivers are just a portion of incredible attractions in Leh that are sure to impress glampers.